This week we are hosting our 2nd annual LEGO WEEK! We had so much fun with LEGO Week last year that we needed to do it again! We love coming up with fun and playful learning activities using LEGO and LEGO DUPLO. This week we'll be sharing 5 days of cool activities all focused on ways to play and learn using LEGO. Activities featured will be primarily for kids ages 3-5 though many of them could be modified to be used with older or younger kids. If you are just getting started with LEGO DUPLO, here is my favorite basic LEGO Duplo starter kit. We also like these building plates for building on. 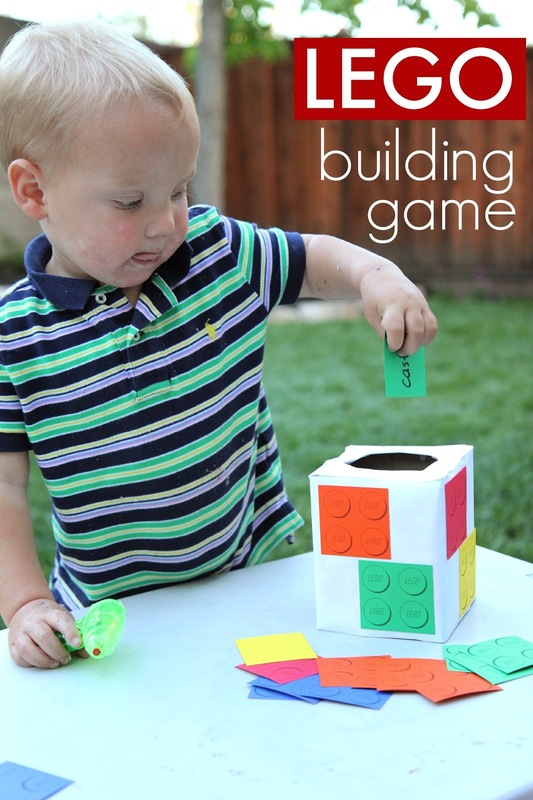 For our first LEGO Week activity we are sharing a cool pick and move building game. Kids pick a LEGO challenge and then get to do a little movement activity before they start building. We are always trying to find ways to embed movement into learning and this activity helps kids work on color recognition while also doing some gross motor movements AND using hand-eye coordination and fine motor skills as they build their creations with LEGO. We chose to use LEGO DUPLO for this activity but you can easily use smaller LEGO as well. To get started we brought our buckets of LEGO outside. Taking activities outside can be a real game changer. Seeing materials in a different space can spark the imagination differently. In our case, usually our LEGO stash is close by loads of other toys. In this activity the buckets of LEGO were the only things outside. My kids discovered all sorts of new pieces and focused in a completely different way than they usually focus when building in our playroom. 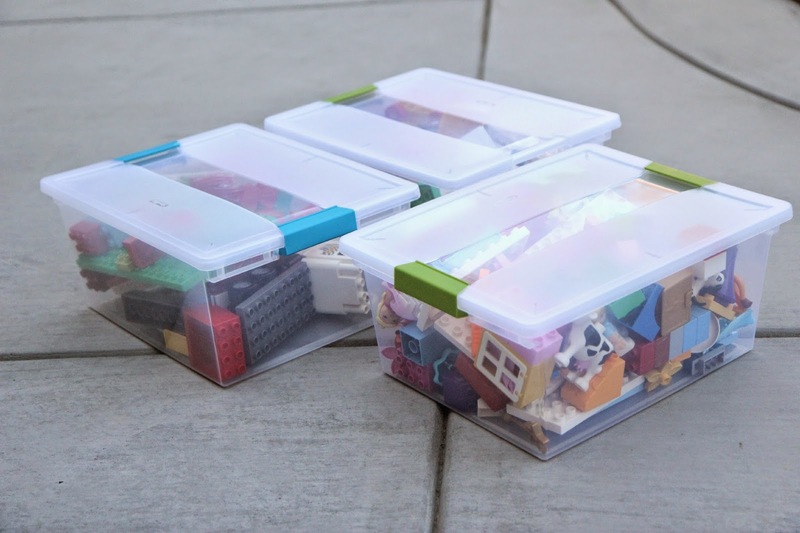 To play our LEGO Pick & Move Building Game you only need a few things. To get started I wrapped a small tissue box with white easel paper and tape and then I made sure to leave a hole at the top. Next I printed out some colorful LEGO paper using the Free LEGO printable pdf from Delia Creates and some colored cardstock. I did one on each color. 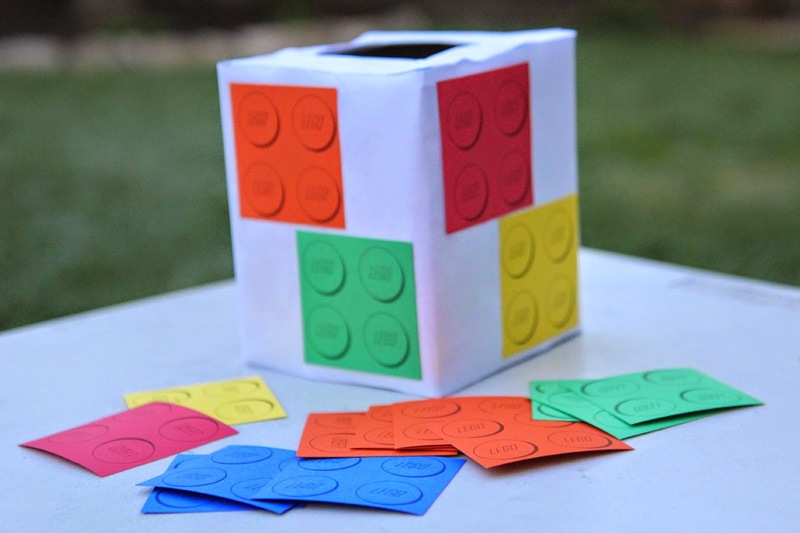 Next I cut out the colored cardstock bricks into different shapes (mostly square, though some rectangle). I glued a few onto the sides of our white tissue box (just to dress it up a bit) and then on the rest I wrote some LEGO challenges. LEGO Challenges are just suggested things for the kids to build... just to get their juices flowing. Each colorful card had one or two words on the back to tell the child what to build. With younger kids just doing a tower is the easiest. With older kids you can get even more complex and ask them to build their favorite location in a move or their favorite place to go to eat, etc. 1. Pick a colored LEGO card from the box. 3. Start your challenge! For the hard version of the game the kids had to make their project ONLY using the color of LEGO that was on their card. For example, if their yellow card said "playground" then they would need to build a playground only using yellow bricks. This was easy for my 7 year old and a bit harder for my 4 year old. My 2.5 year old just stuck to building with whatever color he wanted to use. I love what these little imaginations come up with! Do your kids have a favorite building project they like to make? Have any suggestions of other things to make as part of the LEGO challenges? Don't forget to come back tomorrow to see what we are going to share next! LEGO Week will be going all week long! If you are on instagram come share your photos of what you do this week using the hashtag #legoweek. I'd love to come check them out! I am @kristinatoddlerapproved on Instagram.